Indulge your patrons with the rich, creamy flavor of dark chocolate blended into their coffees and specialty drinks with this Torani 64 oz. dark chocolate flavoring sauce! It is packaged in a user-friendly 64 oz. plastic squeeze bottle to keep your coffee shop or cafe in good supply. Featuring a thicker consistency than liquid flavoring syrup, this flavoring sauce is great for swirling atop whipped cream or blending into sweet frappes. It adds just the right amount of decadent dark chocolate flavor to any cup of freshly-brewed coffee. You can even use it to top ice cream, cheesecakes, and other homemade desserts. This Torani sauce will be the perfect, finishing touch to any beverage or dish, and is sure to keep your guests coming back for more! Ghirardelli has great products and this is certainly no exception! We have used this product in coffees, for milkshakes, on top of desserts, and even a few other things. Each thing we’ve used it on, our customers have loved it! Torani Dark chocolate sauce is so divine! It is rich and cream and full of flavor. Since it is very rich you don't need a lot to get a nice chocolatey flavor. this tastes AWESOME in a blended drink or over ice cream. it has a really smooth consistency and it is not too sweet. the bottle lasts forever. Probably out #1 sauce we do through. We have several drinks with this sauce and they are all winners with our customers. We are always happy with this product. I have tried numerous Chocolate sauces for our espresso bar. This Chocolate sauce won all the taste trials hands down. It has a very smooth but rich Chocolate taste. This chocolate sauce is absolutely delicious. I make a banana split cupcake a d this is the perfect sauce for drizzling over the tops of them. Relatively high quality dark chocolate sauce. Great for shakes and mocha coffee drinks. Could be a little less sweet, but most people seem to love it. This rich dark chocolate sauce has become a main ingredient in many of our frappes. It blends well with ice and the frappe base but is thick enough to also hold to the glass and for drizzle topping. We LOVE this sauce! Since it is sweet you don’t need to add any sugar. Love that it comes with an extra seal around the cap so it doesn’t spill during shipping. This dark chocolate sauce has a variety of uses. I used it initially to drizzle on my cupcakes but then decided to add it to my white icing to make chocolate. Delicious! Torani dark chocolate sauce is by far one of my favorites! I wouldn’t consider using any other product in my store. It gives a rich chocolate flavor to our lattes!! This is the best chocolate sauce around, along with the best price for the product around. And if you order it by the case then it is an even better deal! Quality shipping, as well as excellent quality product! Caution: Delicious. A few pumps of sauce, some steamed milk, and a dollop of whipped cream on top makes the perfect Hot Chocolate. Can be used to enhance almost any beverage and has many culinary applications as well. Hands down one of our best selling flavoring sauces that we currently have in stock. It is really smooth and not too strong. I use it a lot. This size is a great cost saver compared to the 16.5 ounce. Same quality and taste. Highly recommend buying the pump to go with the 64 oz. size as it’s ackward to use otherwise. A nice rich dark chocolate flavoring sauce that works great for making sundaes and topping ice cream cups. The sauce works great in our dispenser. A nice rich, and dark chocolate sauce that is perfect for garnishing deserts and ice cream. The sauce is thick and delicious. Makes a really nice accompaniment to brownie sundaes. Really great tasting , creamy , rich and smooth chocolate drizzle. good for not only coffee but any confectionery. Enhances the presentation of our coffee products. This is my absolute favorite chocolate sauce for coffee drinks. Not too sweet but dark and rich, Torani's syrup gives a quality chocolate flavor, rather than the typical artificial taste of other syrups. This dark chocolate sauce is a necessity for every coffee shop to have! This flavor is great for mochas, hot chocolates, and even chocolate milk. Torani makes the best chocolate sauces that I have ever tasted. I ordered this sauce for my ice cream shops and our customers go through this stuff like crazy! Torani dark chocolate flavoring sauce is a great choice. We are very happy with the quality of the sauce. We use this for all of our drinks that call for chocolate sauce. It is also great for drizzling over ice cream. A very rich and decadent dark chocolate sauce that is great for flavoring sundaes or shakes. A very nice thickness and great for garnishing desserts. We use this chocolate at the coffee stand I work at. It’s easy and blends into the coffee nicely, I like it as a barista and a coffee drinker. When I bought my espresso maker I needed the syrups to go with it. This one is my favorite. I make a skinny mocha every morning and love the richness of this chocolate sauce. A little goes a long way to make the coffee feel as indulgent as European chocolate treat. I can't get enough of this chocolate syrup. I've put it in my drinks and even on my desserts. I've made smores cupcakes and drizzled this on top. all the torani flavored sauces are very good with out faux flavor. we use this with ice cream and for chocolate flavor in recipes and with milk. The dark chocolate flavor is to die for! Probably our most popular shake and ice cream flavor over all. Customers love putting the sauce on top also! This is a nice, high quality chocolate sauce with good texture and flavor. To me, it tastes more like milk chocolate than dark chocolate, but that's what I prefer anyway, so I don't mind. So dark, rich and luscious. A silky smooth dark chocolate flavoring sauce that is perfect for creating a brownie sundae. The sauce is a really good quality and works great in my squeeze bottles. I am so impressed with torani's sauces. I love their coffee syrups and these don't trail far behind. The chocolate syrup is very rich and delicious. This chocolate syrup is great. It has a lot of flavor and adds a rich cocoa taste to anything you put it in. I even like it on desserts. This sauce tastes amazing. I love adding it to my drinks as well as my desserts. I tried it on a deep fried Oreo and it was delicious!!! This syrup is extremely flavorful and rich. I like to add it to hot chocolate to give it more depth and a stronger chocolate flavor. I love how chocolatey this syrup is. Some brands don't taste rich enough but this one definitely fits the bill. I like swirling it on the inside of a cup before I pour in my latte for decoration. It slowly mixes in with the coffee and is delicious! The best Flavoring Sauce for a great price; I use it on ice cream and desserts for my clients and at home. You can purchase the .5 oz Torani Pump sold at webstaurant to make serving easier. The Torani Dark Chocolate is a deep, richly flavored chocolate my customers love in Mochas and Hot Chocolates. In a pinch I was forced to use a substitute and the difference in quality was instantly noted by my customers. The taste of this sauce is awesome! My only problem with it is that it hardens up to almost a paste when the weather changes slightly, and it requires a lot of attention to get it to the proper consistency again. The pump clogs constantly because of this, and it makes a big mess. Any advice on this would be appreciated! This larger, 64 oz bottle of syurp from torani is a must have for any coffee shop. Hot chcolates and mochas are as simple as a few pumps with this sauce. We love Torani 64 oz. Dark Chocolate Flavoring Sauce . Torani makes a great product at a great price. They also offer a great selection of flavors. My husbands favorite chocolate is dark chocolate. Torani's thick sauce in a large economical 64 oz container is perfect for his lattes an evening bowls of ice cream. So happy to have found a portion that will last me more then two days now. This one's so good, I'm almost out of it. A big favorite is the 24601 cappuccino (we're a bookstore, so... Les Mis) made with dark chocolate and white chocolate. Come packages very well. Expensive to buy one at a time, so you really need to combin shipping and get at least 9. Great dates to last a while. Even if you're a milk chocolate fan, this dark chocolate sauce is a must. If you're creating any coffee based drinks Torani dark chocolate sauce is the way to go. Torani's dark chocolate sauce is thick, rich, and creamy. It's delicious and has an impressive taste. The 64 oz. bottle is a great size for our cafe. Great chocolate sauce to use as a topping for various things. I like to put it on top of whipped cream as a drizzle to add more chocolate flavor. True to taste and the quality company that Torani is. They are close to the only company that we have seen offer the variety of sauces they do (especially Dark Chocoalte) and have such a fresh taste. Our kids love chocolate in general (don't most kids?) and aren't huge fans of Dark Chocolate, but they love this one! Torani makes awesome sauces. And this is one of our favorite at our coffee shop. Customers love it and is alway sent by Webstaurantstore.com packaged professionally and quickly. Love the flavoring sauce. Nice addition to our coffee bar and just the right amount of sweetness. Nice price for the large 64ozs it comes in . Torani 64 oz. Dark Chocolate Flavoring Sauce is amazing! So Rich and thick. It doesnt take much to make a Mocha Latte that will knock your socks off! I found that when making chocolate or caramel drinks, I like this product better than the thin syrups because it gives a richer, more true to taste flavor. These thicker syrups don't taste as artificial as some of the other ones. It's pretty good, but not quite as 'dark' as I would like it to be. I bought this one for the ingredients (lack of high fructose corn syrup). It's one of the better sauces out there, but could be a little darker. I was expecting something dark, but Torani dark chocolate sauce tastes more like sugar added to chocolate. I do not like the taste too much. I will not be purchasing it again. 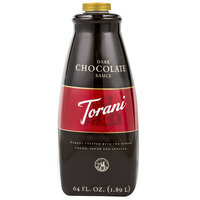 This 64 oz Dark Chocolate Flavoring Sauce from Torani is so absolutely delicious! We can make our best mochas because of this great, yummy product! This sauce is really great drizzled on top of a cappucino or even as a latte base. it has a great taste and mixes well for latte recipes! SO so glad we found this big size. We used to go through this stuff with the smaller bottles every week. So the bigger bottle with its own sauce pump is a life saver!! Great price, great product, 2 thumbs up! Just okay. With all the really positive reviews I guess I was expecting more. It's not bad just not great either. Some other syrups I had were either just as good or better. Love, love, love this sauce. Great quality-although I don't really think this is dark chocolate as another reviewer mentioned. I use this for hot chocolate and cafe mocha. Customers love it, too. We bought this syrup because the high quality "Gourmet" chocolate sauces we were wanting to use wouldn't arrive in time for our store's opening. Once we tried these we instantly regretted ordering the others. The Torani chocolate sauces taste ten times better than the so called "Gourmet" sauces. It's especially easy to tell the difference when making a hot chocolate. Mixing Torani Dark and White chocolate with steamed milk makes for the BEST hot chocolate. We tried making it with the other stuff and were intensely disappointed. I love this sauce, but I disagree. It is not dark chocolate. To me this has a sweeter taste. It is darker then milk chocolate, but it isn't as bitter as dark chocolate. Great sauce that adds flavor and lets you make a mocha at home! Just add coffee and steamed milk to about 3 pumps of this sauce and you have yourself a cafe quality beverage! Great Chocolate sauce! I've tried the other flavors as well. All are very good. We are very happy with this product. We will buy again. Better than the popular syrups, the ingredients are all real, nothing artificial here. You can't find coffee syrups made with this level of quality anywhere. Be the best coffee shop in town with this product! We use this for so many different thing. Decorating lattes during etching, plating, base for our mochas, hot chocolates, choco steamers, the uses are so vast and for the price it is shockingly cheap! We like that we can buy the dark chocolate sauce in bigger bottles, for our convenience, easier to refill the smaller ones. It's easy to pour and pump out for the many different uses that we use it for. This sauce has the right consistency to mix well with steamed milk to create hot chocolate and mocha's. It even works great as an ice cream topping. Deep chocolate flavor loaded in each and every bottle of Torani syrup. I love their caramel sauce as well! Don't use the cheap stuff when you can get top quality for just a few bucks more! Used to use Ghiradelli sauce, but Torani is so much better for what we do. Our customers love it compared to when we used the other product. Love it! Love this dark chocolate sauce! Its so good in almost anything that you make at home or in a coffee shop. The price is great as well. Delicious product. We use it to make hot and iced mochas and our customers love it. It mixes well into hot or cold drinks and is not at all grainy. Perfectly sweet and chocolately and tastes very rich. Torani is a dependable brand, especially for coffee flavorings. We are excited to use the dark chocolate flavoring in lattes, coffee, and other good drinks. Wow! I am so impressed by the amazing flavor. I add this to almost everything. I use it in my berry smoothies. I add it to my iced coffees and in my lattes. It really has a way of making everything better. Mmm, mmm, mmm! This chocolate sauce from Torani is excellent and well priced. We use it in all of our hot, iced, and frozen drinks at our coffee house. Love the dark chocolate. We have to order this in bulk because we run out of it so quickly. Its perfect for our little coffee shop. We tried 3 chocolate sauce brands side by side in a blind test with our staff and customers. The Torani has a richer multifaceted chocolate flavor and thicker than the others meaning you need less of it to flavor the same size drink. Better flavor and better cost was an easy decision. Always a favorite. My shop has been using Torani for some time now and I think we are sticking to it because of the awesome taste we get from the products!